This past weekend the sun was finally shinning and the temps finally broke 80. Hallelujah it’s almost summer!!! 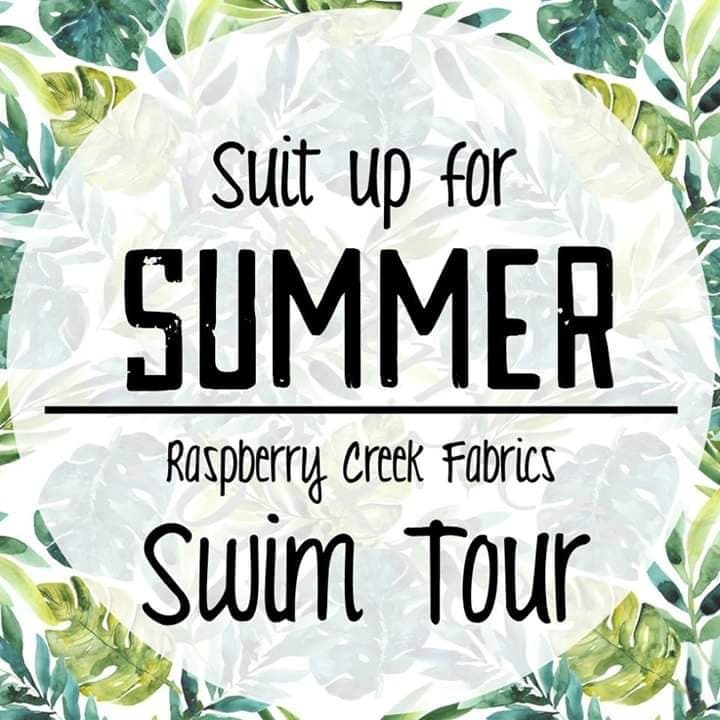 To celebrate, I sewed up some new swimsuits for my crew with the most cheerful, beautiful stripe swim knit from Raspberry Creek Fabrics for their Suit up for Summer Swim Blog Tour. There’s a killer lineup of sewing bloggers that had the chance to play with some new amazing prints, be sure to read through this post for all the details (and discounts)! I have to admit my heart was a little broken because for the first time in 7 years, we weren’t minutes away from the ocean. We got a little creative with our photoshoot and had a blast though! At first, I had planned on making matchy suits for my girls from this fantastic, bold stripe. As soon as it arrived, it was love at first sight!!! I knew I had to make myself something too. I played Pattern Tetris like a boss and somehow squeezed out enough of the swim knit to sew myself a top! Thank goodness I have some solid navy bottoms from my me-made suit last year that will pair perfectly. I love how the colors are bold and vibrant and so on trend right now! And, you know my love of stripes runs realllll deep. It has such a retro vibe that is great for swimwear. The fabric is printed matte so it’s not shiny like some other swim fabrics and feels more like the high quality swim suits! It does have 50+ UPF protection and is a four way stretch (which is critical if you’re playing pattern tetris like I did!). There are some other really awesome prints that coordinate with the colors in this stripe available as well! Be sure to check out the amazing selection here. I used the new Ophelia leotard pattern from Violette Field Threads for their suits. I wanted a super simple silhouette to really showcase the fabrics so I sewed the one piece bodysuit option and left off the sleeves. I was going to pair a tulle hi/low skirt with their suits to add in some more details but this stripe was too good to distract from with other fabrics so we kept it plain. I used the clear elastic neckline and arm finishing option which meant these two suits were sewed up in an hour from cut to finish. I made a size 7 for my oldest and wished I had sized up to give her more growing room this summer. Thank goodness for a younger sister- I know the suit will still get plenty of use! I made the little one a size 6 and it fit perfectly! Mom Moment: I can’t believe they are almost to the top end of the girls size range! Thank goodness for tween pattern sizing! I had initially requested 1.5 yards of fabric and barely had enough to make something for myself. But…I was determined! I have been eyeing the Vernazza Two Piece suit pattern from Friday Pattern Co. for quite some time and took the plunge. I loved the tie front top and thought it would be a great style for this stripe. I sewed myself a Medium because I was worried a small would have too little coverage in the front and I was in between sizes. Next time, I’ll definitely size down to keep the elastic from getting too bunchy on the inside. I followed the pattern to a T. I did add cups between the lining and main and like that extra coverage in my suits. The pattern was a super easy sew and went together also in less than an hour. I told you to keep reading- now let’s get to the really good stuff! This blog tour is jam packed with some amazing sewing bloggers so be sure to check the full schedule and follow along to see great pattern feedback and fabric details if you’re thinking of sewing your own swimwear this year! 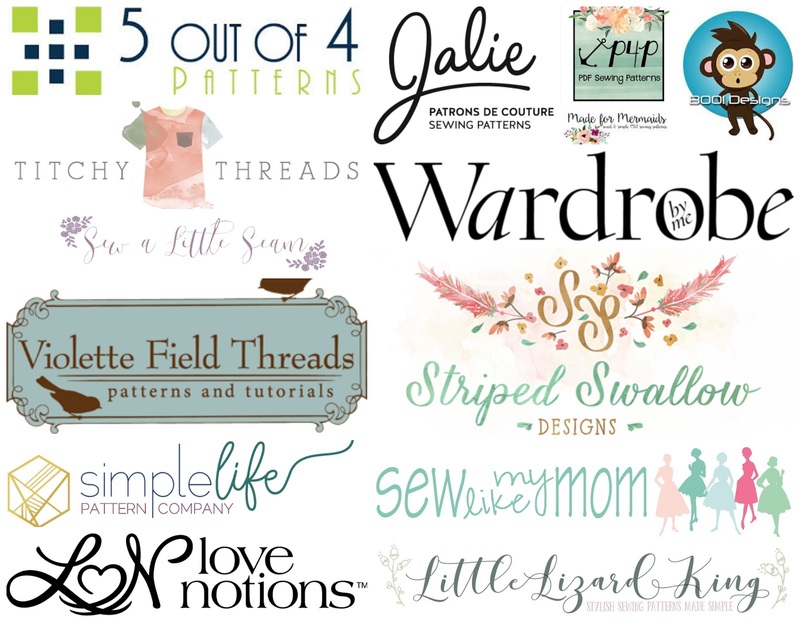 Be sure to grab the discount codes from the awesome sponsors and save while you sew! Big thanks to the sponsors and a special thanks to Karly and Tami for hosting!!! Extra hugs to Raspberry Creek Fabrics for sending along the fantastic stripe swim knit!!!! I’m not sure if I left a comment already or not but I’m so in love with these swim suits! Love the stripes! Thank you so much!!! I had a blast with this blog tour! I love your different placements of the stripes. It makes every suit look completely different while still using the same fabric. I’ve also been dreading my oldest starting to peak at the top of several of my favorite girl’s size charts. Life it about to get hard. Thank you! I tried to play with the stripe placement for interest- I am glad someone noticed! I should have requested more…but I do love a good challenge! They do look fab with the white pants though!